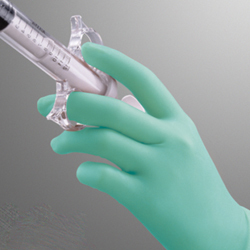 Medline's Aloetouch® Orthopedic gloves are suitable for the most rigorous surgical procedures. The Aloetouch® Ortho is 20% thicker than standard surgical gloves for more protection and durability. These gloves have an aggressive grip and a unique, reinforced beaded cuff to resist tearing. In addition, Aloetouch Orthopedic surgical gloves have an inner coating of Aloe Vera to help moisturize and soothe dry, irritated hands.